A research team led by Tohoku University in Japan has developed new materials for supercapacitors with higher voltage and better stability than other materials. Their research was recently published in the journal Energy and Environmental Science. Supercapacitors are rechargeable energy storage devices with a broad range of applications, from machinery to smart meters. They offer many advantages over batteries, including faster charging and longer lifespans, but they are not so good at storing lots of energy. Scientists have long sought high-performance materials for supercapacitors that can meet the requirements for energy-intensive applications such as cars. "It is very challenging to find materials that can both operate at high-voltage and remain stable under harsh conditions," says Hirotomo Nishihara, materials scientist at Tohoku University and co-author of the paper. Nishihara and his colleagues collaborated with the supercapacitor production company TOC Capacitor Co. to develop a new material that exhibits extraordinarily high stability under conditions of high voltage and high temperature. Activated carbons are used for the electrodes in capacitors, but these are limited by low voltage in single cells, the building blocks that make up capacitors. This means that a large number of cells must be stacked together to achieve the required voltage. Crucially, the new material has higher single-cell voltage, reducing the stacking number and allowing devices to be more compact. The new material is a sheet made from a continuous three-dimensional framework of graphene mesosponge, a carbon-based material containing nanoscale pores. A key feature of the materials is that it is seamless—it contains a very small number of carbon edges, the sites where corrosion reactions originate, and this makes it extremely stable. The researchers investigated the physical properties of their new material using electron microscopy and a range of physical tests, including X-ray diffraction and vibrational spectroscopy techniques. They also tested commercial graphene-based materials, including single-walled carbon nanotubes, reduced graphene oxides, and 3-D graphene, using activated carbons as a benchmark for comparison. They showed that the material had excellent stability at high temperatures of 60 °C and high voltage of 3.5 volts in a conventional organic electrolyte. 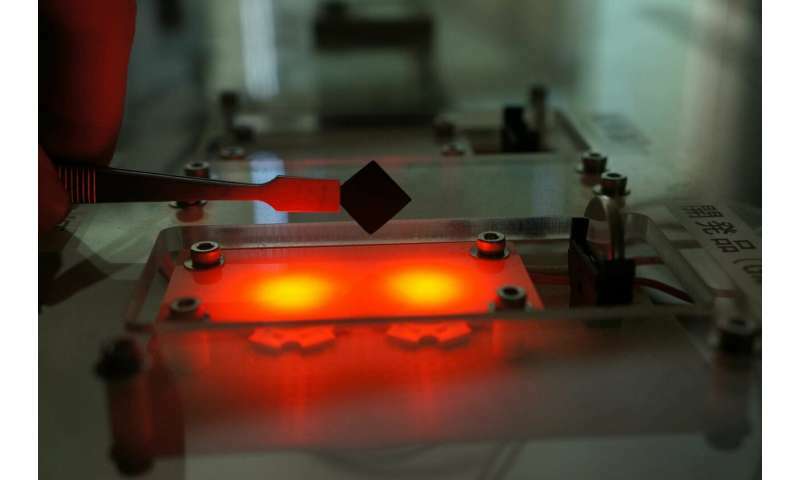 Significantly, it showed ultra-high stability at 25°C and 4.4 volts—2.7 times higher than conventional activated carbons and other graphene-based materials. "This is a world record for voltage stability of carbon materials in a symmetric supercapacitor," says Nishihara. The new material paves the way for development of highly durable, high-voltage supercapacitors that could be used for many applications, including motor vehicles.